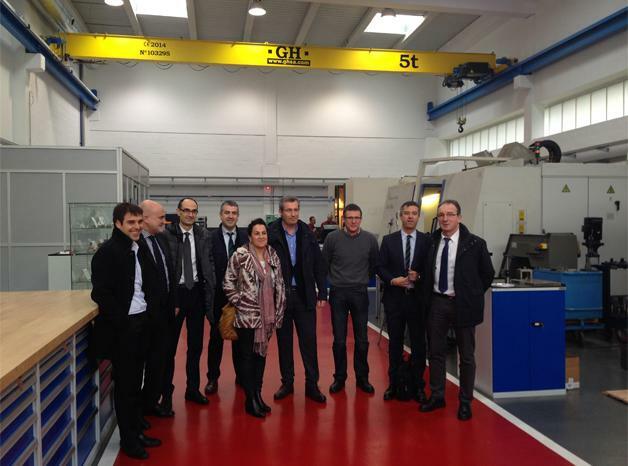 The Head of the Provincial Council and the Minister for Economic Promotion visited IMH, Ibarmia and the Danobat Group. Some of the most representative companies from the Machine-tool sector of Guipuzcoa were visited today by the Head of the Provincial Council of Guipuzcoa, Market Olano, together with the Minister for Economic Promotion, Ainhoa Aizpuru, the Director General for Economic Promotion, Antton Tomasena, and the Director General for Innovation, Garikoitz Agote, who were accompanied by the President of AFM, Advanced Manufacturing Technologies, Antxon Lopez Usoz and its Director General, Xabier Ortueta. The directors from IMH (Elgoibar), Ibarmia (Azkoitia) and Danobat Group (Elgoibar) presented their companies and showed their production facilities at a meeting that has favoured a review of the general situation of the sector and its future perspectives. On his part, Markel Olano has taken advantage of the occasion to inform the business people of Guipuzcoa about the strategy of the Provincial Council for the historical territory of Guipuzcoa. Although the figures are still provisional, there was a slight increase, 3.4%, in the turnover of the Machine-tool and advanced manufacturing technologies sector in 2015. Despite the difficulties of the financial year that began better than it ended, the global data indicate that the figure has been driven by the start-up, which has increased by 4.6%. Deformation, however, has dropped slightly, by 0.16%, practically maintaining the figure of 2014. Components have also suffered a decline of 7.9%, drawn by the situation of China, but the other subsectors, other machines (+9.5%), tools (+6.7%), accessories (+5.6%) and machined products (+6.3%), have improved with respect to 2014. The order acquisition figure was also positive with a noteworthy increase of 10%.